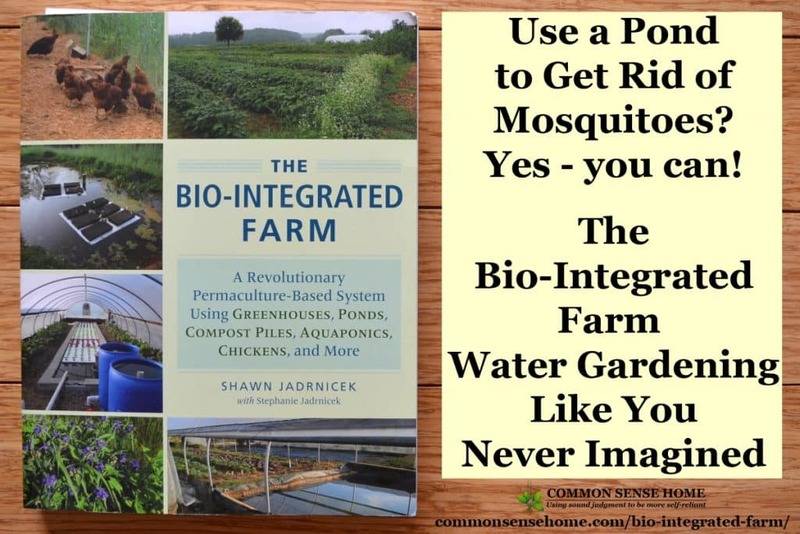 The Bio-Integrated Farm: A Revolutionary Permaculture-Based System Using Greenhouses, Ponds, Compost Piles, Aquaponics, Chickens, and More by Shawn Jadrnicek and Stephanie Jadrnicek takes the farm or backyard pond beyond beyond a simple water garden or rainwater storage to turn it into a multi-function element of your homestead. With a detailed discussion of construction and usage, Shawn opens up a wealth of opportunities to increase food and energy production using the power of water. What is The Bio-Integrated Farm? When a component in a farm or landscape—which could be a water garden, greenhouse, or chicken coop—performs seven functions, the component becomes alive, and I call this bio-integration. The concept is derived from Bill Mollison’s definition of permaculture design “…assembling conceptual, material and strategic components in a pattern which functions to benefit life in all its forms.” He then states: “Every component of a design should function in many ways.” I build on this definition with design components that function in at least 7 ways and some that have over 20 functions. As Shawn and Stephanie explain in the book, a properly designed water garden or pond can accomplish many functions – not the least of which is mosquito control. Yes, you read that right. If designed correctly, a pond can actually reduce the mosquito population in an area. 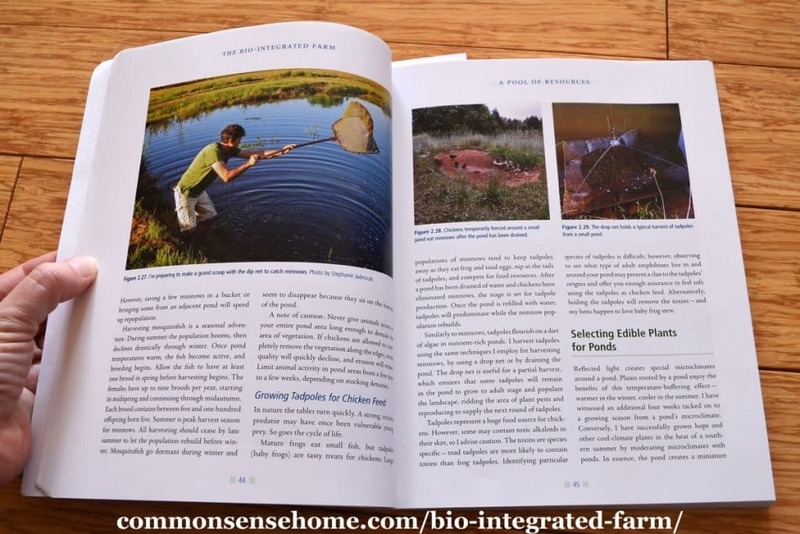 Filled with full color photos and illustrations as well as step by step instructions, The Bio-Integrated Farm challenges the reader to reconsider (and likely reconfigure) their landscape in ways that I have not seen outside this book. There is work involved in the setup process – anyone who has worked with ponds knows that significant earth moving is required for pond setup, lining, planting, stocking, etc – but the end product creates a robust, interconnected permaculture system that can make the land you have more productive in less space. This is not a book that most people will sit down and read in one fell swoop – there's a TON of information to digest. This is a book that you're likely to dig out again and again as a source for ideas and new projects. Two projects that I personally want to explore further are rainwater catchment (beyond our rain barrels) and heating the greenhouse with compost. The only downside I found in this book was that the author has worked in much warmer climates than where I live. Although dealing with winter was discussed, there's not a single snow covered snapshot to be found. I'm also a little nervous about the suggested proximity of some of the pond designs to buildings. Maybe it's different in warm weather areas, but with our hard freeze/thaw cycles, the earth moves quite a bit. Over time, this might lead to some foundation issues with a pond placed close to the home. Use your judgment, and talk to someone who works with foundations in your area before digging a large hole within 10 feet of your home. 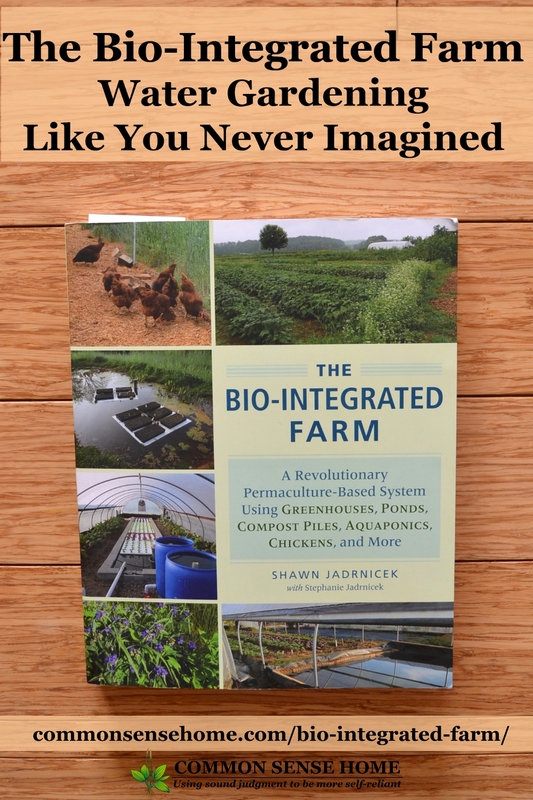 If you're ready to take your gardening, farming or permaculture efforts to the next level, The Bio-Integrated farm is a worthwhile investment.